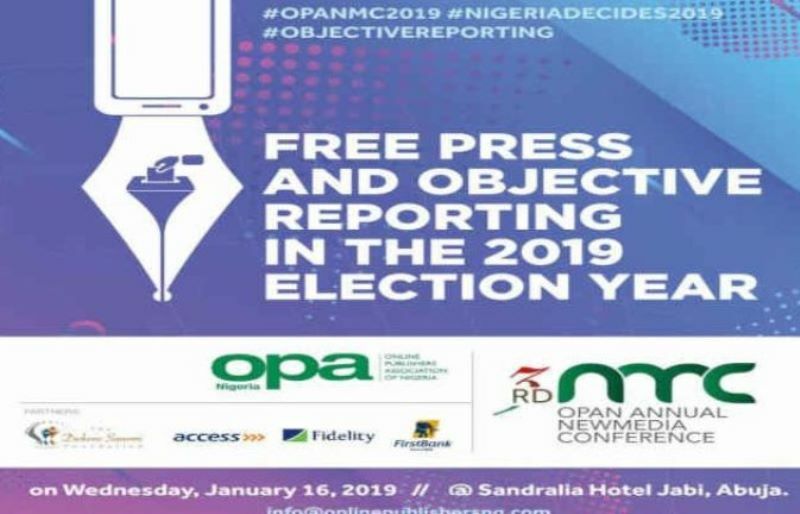 All is set for the third edition of the Online Publishers Association of Nigeria (OPAN) Annual New Media Conference holding at the Sandralia Hotel, Abuja, Nigeria, on Wednesday 16, January 2019. In a media statement distributed on Friday, OPAN President, Austyn Ogannah, said the one-day conference will provide an interactive platform for new media practitioners – publishers, bloggers and social media influencers, to engage with government and state institutions on issues bothering on legal and regulatory frameworks for reporting elections, corruption in elections, ethics and professionalism in reporting elections in Nigeria and the independence and media literacy of the judicial system. Ogannah said top officials including vice presidential candidates of the two leading political parties – Vice President Yemi Osinbajo SAN (APC), Mr. Peter Obi (PDP), INEC chairman, Mr. Mahmood Yakubu, EFCC Chairman, Mr. Ibrahim Magu, candidates of other political parties, lawmakers, lawyers, and representatives from civil society groups and the judiciary will participate at the conference. The president further said all addresses delivered at the conference will be complied and published in a book to be unveiled at the 4th annual conference next year. The president further said all addresses delivered at the conference will be compiled and published in a book to be unveiled at the 4th annual conference next year.